Skydiving FAQ: how high, how low, how fast? Skydiving: How high is too high? How low is too low? Me showing my good side while bailing out over my campsite in the Mojave desert. This photo never ceases to get my attention because it looks like I'm skydiving at a really low altitude. It's only an optical illusion created by the out-of-focus ground features. I exited at 3,500 feet on this jump. How high do skydivers usually exit? The standard sport skydiving altitude is 12,500 feet AGL (Above Ground Level), sometimes up to 18,000 feet depending on the altitude of the drop zone, type of aircraft and type of jump. From these 12,500 feet at a typical belly-to-earth fall rate of around 115 mph, a skydiver can enjoy a freefall of up to and slightly over one minute until he or she reaches pull altitude. This time frame shrinks considerably if the skydiver falls in a vertical head-down position (a form of freefall called "Freeflying"), or expands to around double that number if the skydiver is wearing, and properly using, a "wing suit" which can nearly halve freefall speeds. Large freefall formations (say, around 100 or more skydivers) require more time to build (form-up in freefall), thus such jumps start at higher altitudes and often require that jumpers breathe bottled oxygen during the climb to the higher altitudes (around 18,000 feet is typical). High altitude jumps made for the sake of making a high altitude jump. 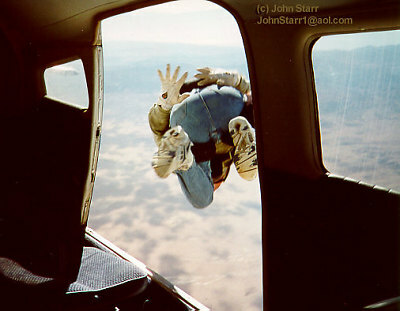 Some skydive centers offer high altitude jump training for experienced jumpers. Such jumps can approach 30,000 feet. During such jumps, skydivers must carry & use bottled oxygen ("bailout bottle") in freefall. Basically, a high altitude jump is a feather some skydivers want in their cap. As of October 24, 2014 the record for the highest parachute jump is 135,890 feet, just over 25 miles up. The jump was made that day by Google Senior VP, Computer Scientist, Alan Eustace. It smashed the previous world record of 127,852.4 feet (38,969.4 meters) set by Austrian skydiver Felix Baumgartner on October 14, 2012. For both jumps, the extreme altitude required these men wear a specially designed, fully pressurized astronaut-type pressure suit, or space suit. Without it, their blood would have boiled within seconds of exposure to the near airless atmospheric conditions at those altitudes. Both men used custom designed high altitude balloons for their ascents. Baumgartner's system used a pressurized capsule which he had to exit once the balloon reached its peak altitude. Developed in secret, and with no fanfare or publicity (unlike Baumgartner's highly publicized Red Bull sponsored event) Eustace's system was simpler and lighter; Eustace rode to altitude suspended in the open air in his spacesuit below the balloon until time came to disconnect. Baumgartner has the distinction of being the first person to break the speed of sound without the use of a vehicle, reaching 843.6 miles an hour, mach 1.25. Eustace also broke the speed of sound, but at 822mph was slightly slower than Baumgartner's record speed, likely due to his use of a small, stabilizing drogue chute during his fall. On August 16, 1960 Major Kittinger's successful 102,800 foot U.S. Air Force Project Excelsior test jump, also from a helium balloon, set a record that stood 52 years until Felix's October 14, 2012 jump. Keep in mind: when Joe made his 1960 test jump, the world's first human astronaut, Yuri Gargarin, had not yet flown into space. Only military test pilots had exceeded 100,000 feet of altitude in experimental rocket aircraft. Joe was clocked falling at 614 miles an hour. He approached the speed of sound in freefall, but did not exceed the speed of sound. He deployed his parachute at 18,000 feet (5,500 meters). Joe Kittinger: "...in my case I was very close to supersonic, in Felix's jump he's going to-- he will be supersonic, which will be a very unique experience. That four miles higher that he is going to be, will give him the lack of (air) density that will allow him to go faster than we could on my jump." Joe Kittinger later worked as an advisor to Red Bull's Stratosphere project to help Felix Baumgartner smash his old record. If data existed to support the claim that Joe was the first person to free fall at supersonic speeds, I'm sure Joe would be at the forefront of getting that data out there, not flatly denying it on international TV. An automated camera in the balloon's gondola took movies of Joe falling away. One of those frames made the cover of Life magazine. The USAF never submitted the jump to the FAI, and the FAI rules likely preclude the use of the stabilizing drogue. So for years the former USSR held the official FAI world altitude record in this category-- a jump made by from 83,500 feet by Maj. Yevgeny Andreyev in November 1962. But good luck finding anybody who recognized Andreyev over Kittinger. During most of the freefall descent, a small drogue chute stabilized Joe's freefall and slowed him down a bit. Many purist sport skydivers appropriately call his freefall "drogue fall" since it wasn't truly free of a decelerator device. What's the highest parachute jump made without the use of a bailout oxygen supply? On November 14, 1995, French skydiver Patrick De Guyardon set the record exiting a Russian IL-76 transport at just below 42,000 feet. The jump was made over Ermolina military base, near Moscow. A second jumper, Olav Zipser (who, in photos appears to have used a bailout oxygen supply) accompanied Patrick and took photos. To survive his descent to lower altitudes Patrick breathed oxygen on the plane, then simply held his breath during freefall in the approximately minus 67 degree air. To expedite their fall to lower altitudes, Patrick and Olav both linked up in a head-down "freefly" position, which increased their freefall velocity. How low do skydivers deploy their parachutes? The United States Parachute Association sets minimum pack opening altitude at 2,000 feet AGL(Above Ground Level as opposed to MSL -- Mean Sea Level) for experienced skydivers, 2,500 feet for slightly less experienced skydivers, and up to 5,500 feet for certain training jumps. These recommended pull altitudes are largely respected and observed in the skydiving community. An exception to this rule are properly trained & equipped BASE jumpers, as described in the last paragraph below. How fast do parachutes open? A properly packed and deployed skydiving "ram-air" reserve parachute can open within 200 feet. Primary, or main, parachutes are often packed (some even designed) in a manner that actually slows their opening by as much as several hundred feet, sometimes more. This is desirable in a main parachute because fast openings usually mean hard openings. Hard openings can be painful and unnecessarily hard on equipment & jumper. This isn't conducive to a long skydiving career. Reserve parachutes are built to take it, and the sometimes painfully quick reserve parachute openings are the price you pay for super fast emergency parachute openings -- which, thankfully, aren't very frequent. Do skydivers use their reserve parachutes often? Your chances of seeing an emergency reserve parachute deployment at a busy skydive center ("drop zone") during the course of one weekend are fairly good. However, this has more to do with statistical odds piling up. During the course of two or three days at a busy skydive center, many hundreds of jumps may take place. It's not uncommon to meet skydivers with thousands of jumps, and only a handful of reserve parachute deployments to their credit. Also, many reserve deployments aren't dire emergencies where the reserve meant life or death to a jumper. As the axiom says "if in doubt, whip it out." Many jumpers faced with minor problems such as a broken line, or minor canopy damage choose to jettison the questionable, but apparently functioning, parachute and go to their more reliable reserve. So long as the jettison and reserve activation are initiated at a safe altitude (minimum 1,600 feet as per USPA recommendations), this is actually considered to be a very conservative practice with benefits ranging from peace of mind, to avoiding sprains broken bones (incurred when a damaged canopy lands you too fast or too hard), to saving your life (when a damaged canopy lands you way too fast or too hard). Because of the extremely high reliability of modern reserve parachute systems, many skydivers take it for granted that their reserve parachute will open properly when properly activated. Accordingly, depending on the nature of the emergency, many skydivers regard having to use their reserve parachute as more of a nuisance than a milestone. After landing from an uneventful "reserve ride", some skydivers quickly downplay the event, and instead focus on the hassle it has caused them. For one, when you jettison your main parachute (a necessary procedure in most emergency situations), you risk losing it (jettisoning it -- via a procedure known as a "break-away" or "cut-away" -- causes it no damage, and it can be instantly reattached later). Most jettisoned canopies are recovered, but with prices for new canopies starting at around $1,500.00, one lost canopy can be quite a setback. Two, when a reserve parachute is deployed a fairly expensive component of the reserve deployment system detaches in freefall (as it is supposed to) and can easily be lost. Three, once the reserve has been deployed an FAA certified parachute rigger must inspect and re-pack it. This service can cost around $50 to $75, sometimes more, and cannot always be performed immediately. It's not uncommon to see a skydiver moping around the drop zone after a reserve deployment, frustrated because his "reserve ride" has left him grounded possibly for the rest of the day while he searches for lost gear, and waits while his reserve parachute gets its inspection & repack -- "I&R". As of July 2008, experienced jumpers in Southern California who own their own gear pay $27+ per jump (I used to pay $18 per jump in the 1990s). For their money, they receive a jump ticket to 12,500 feet of altitude, sometimes more. A first jump course & jump can cost anywhere from around $220 to over $300 depending on options like video, photos, and wind tunnel ("indoor skydiving") time. Fully training a skydiver at a USPA accredited drop zone: in the early 1990's I spent about $1,200.00 on a relaxed, hybrid static line/free fall training program that dragged out over a leisurely 14 jumps. Most people then and now train through an accelerated eight jump course for around $2,000. That number can easily surpass $2,000 depending on variables like wind-tunnel ("indoor skydiving") training, repeat jumps when an instructor thinks you need to re-do a certain exercise, and freefall video & photo services, and yes, price of fuel. Do you need a license to be a skydiver? No and yes. The Federal Aviation Administration has no licensing requirements for skydivers. However, most commercial drop zones in the USA are regulated by the United States Parachute Association. The USPA is an organization that oversees sport skydiving in the United States. Among other things, they require skydiver licensing (through USPA's own licensing program) at USPA member drop zones. From how low can you safely jump? Sport skydives are almost never intentionally initiated from below 2,000 feet, but it certainly has been done, usually in emergency situations. The lowest emergency deployment I've ever seen was around 300 feet; the skydiver had only moments under his parachute before he landed. Military parachuting is a whole different ball of wax. I cannot personally attest to their practices, but I've spoken with some former special forces jumpers who spoke of making special static line jumps from well below 2,000 feet. One area deserving special mention is BASE jumping. BASE jumpers are parachutists who jump from fixed objects such as skyscrapers and cliffs. (BASE is an acronym that stands for Buildings, Antenna, Spans (bridges) and Earth (Cliffs), the four types of objects typically jumped). Because most BASE jumps take place well below 2000 feet, BASE jumpers have been forced and inspired to rethink equipment design and parachute packing & deployment methods. As a result, BASE jumpers have developed highly specialized parachute equipment and packing techniques designed to get a parachute open very fast. In the world of BASE jumping, successful free-fall parachute jumps from below 200 feet have been achieved. I have personally made freefall BASE jumps from 350 feet, one static line jump from 145 feet, and a few "direct bag" (a type of assisted deployment) jumps from 210 feet. About me: I was a sport skydiver, on and off, from 1990 to 2004, making about 300 jumps total during that time including 17 BASE jumps. Unlike many of my fellow skykdivers of that time, I chose not to "chase numbers" as it was sometimes called when skydivers rack up several thousand jumps. Instead I chose to seek somewhat more diverse experiences such as outlaw BASE jumps, water jumps, hot air balloon jumps, "bandit" style desert jumps, and jumps from different aircraft such as: Beechcraft Bonanza (a very dangerous endeavour in its own right. I positively don't recommend it! ), a restored Lockheed Super Constellation, even a tiny, old Piper Cub (it was almost impossible to fit in the seat with a parachute on, and we barely got to minimum jump altitude). I produced two films about BASE jumping, later working closely with one of the top parachute equipment riggers in the industry. I started this FAQ around 1999 as a way to answer some of the many "obvious" questions asked of us former and present skydivers and BASE jumpers. Feel free to contact me with questions or corrections. 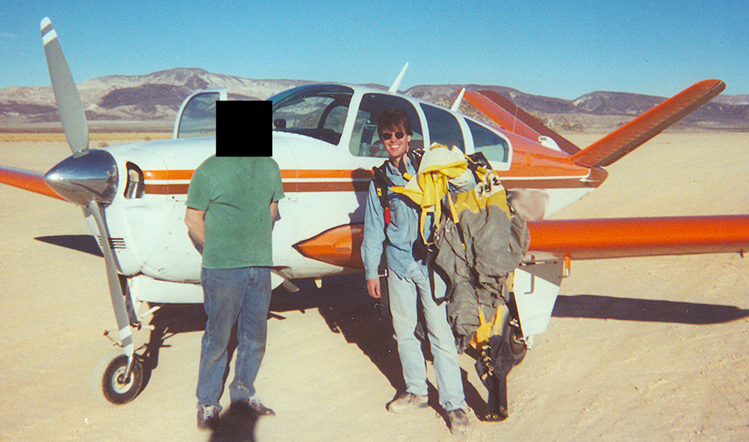 Me and a very experienced civilian test pilot after my one and only jump from a Beechcraft Bonanza.